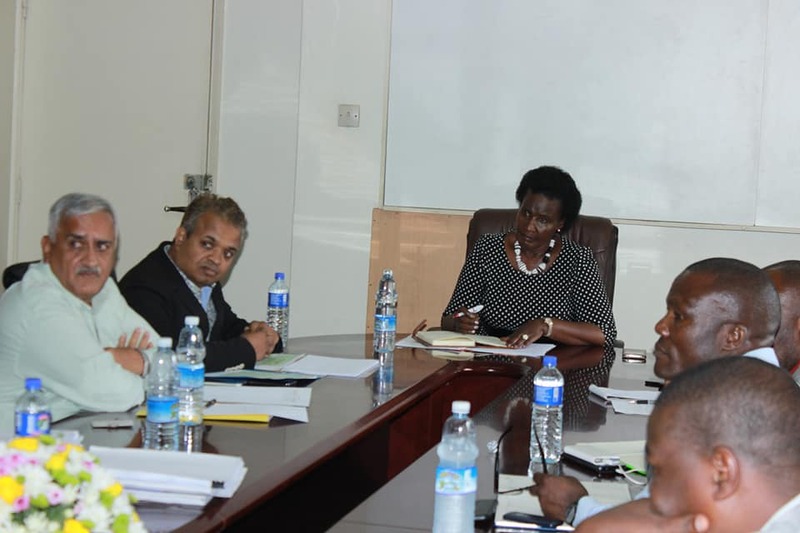 Trade minister Amelia Kyambadde meets cement manufacturers in Kampala on Monday. The Ministry of Trade has given local cement manufacturers up to three weeks to lower the prices or government will allow cheap cement to be imported into the country. Speaking during a meeting with three local cement producers in Kampala on Monday, Trade minister Amelia Kyambadde said the high cement prices have attracted public outcry and will stifle economic growth. Cement prices have over the last two weeks gone up by more than 30 per cent at some retail points, with some outlets selling it at 40,000, up from Shs29,000 a bag. During the Monday meeting, the minister said government is to immediately regulate the export of cement, allowing manufacturers to ration their exports to address the scarcity problem. Tororo and Hima Cement factories, who are the biggest cement producers in the country, also blamed declined production on reduced electricity supply. In response, the Ministry of Trade promised to work with the Ministry of Energy to sort out the problem of power outages that are affecting production at Hima cement. The minister also pledged to fast-track the removal of 10% import duty on clinker and the clearance of clinker that belongs to Hima which is held at the border by URA. Producers had told the minister that the 10% levy on imported Clinker, a key ingredient in cement production in a bid to promote local production of the ingredient, has affected production. Ministry of Trade will also work with the Ministry of Energy to fast track the mining licence for limestone for Hima cement. “Cement Manufacturers have made a commitment which they are to put in writing to double their supply in the next three weeks. If there’s still scarcity of cement by mid May 2018, government will open up and allow importation of cement at special duty rate,” a ministry statement reads in part. A new cement plant is opening up in June 2018 and this is expected to increase production. Minister Kyambadde last week said cement prices are going up as government tasked contractors of large scale government infrastructure projects to start buying products under the Buy Uganda Build Uganda Policy. “There are a number of projects going on like Karuma and Isimba (Hydropower plants), and the oil and gas industry,” she explained. “We gave these people instructions to comply with the Buy Uganda Build Uganda (BUBU) Policy. A lot of cement is going there; about 60%,” she added.